What a crazy week, huh? All I can say is, no one in my neck of the woods is going to pay any attention to whatever the weather person says next! But they better listen up to the Weather Hog! That's right! Only 3 more days until GROUNDHOG DAY! And you know what THAT means, right? Some awesome Phyllis-lovers have already put together their poems for Phyllis, ready for Monday's special post, but if you haven't heard about it and want to join in, hop over HERE. Opening: "Through the school bus window, Unhei looked out at the strange buildings and houses on the way to her new school. It was her first day, and she was both nervous and excited." Brief Synopsis: Unhei's (pronounced Yoon-hye) first encounter with her American schoolmates leaves her feeling uncertain about her name, and different from everyone else. Her name is difficult to pronounce. Kids make fun of it. It sets her apart. How much easier to be Amanda, Laura, or Suzy! So when she enters her new classroom, she tells the teacher she hasn't chosen her name yet - she'll let him know next week. All through the week, her classmates fill a name jar with suggestions they think she might like. But in the end, she is not Amanda, Laura or Suzy. She is Unhei. And she comes to realize just how special that is. Links To Resources: Classroom Activities for The Name Jar; teaching tolerance with The Name Jar; more teaching resources for The Name Jar; make your own Name Jar. Why I Like This Book: This book is beautifully written, clearly communicating Unhei's acute agony over having a name that's different from everyone else's which is just the tip of the iceberg of being and feeling different. She just wants to fit in. But she also loves her Korean family, the Korean market that feels like a little piece of home in this strange new world, and her Korean heritage. She knows the history of her name - how her grandmother and mother went to a name master specially to get the perfect name for her - Unhei, which means "grace." She doesn't want to let go of that. It takes a special friend to help her see that Unhei is who she is and should be. A great choice for any child who is having trouble fitting in, or to help children have more understanding of a friend or classmate who might feel that way. PPBF bloggers please be sure to leave your post-specific link in the list below so we can all come visit you! I love The Name Jar! A very touching and emotional story. Thanks for reminding me about it. One of my favorites, though I've never used it in a peace-class discussion. Thanks for the idea; may have to dust it off and give it a whirl. Happy February! I am surprised I haven't come across this multicultural gem. What a sweet story. Great book! And I am counting on Phyllis to predict early spring next week just as the next snowstorm hits. Throw us a bone! Thanks for sharing the Name Jar - what a neat book. I grew up with lots of Susans and often wished that I could change my name to something more exotic.... I never thought of a name jar. Did you see me standing outside of your door with a plate in my hand all ready for a piece of Phyllis's birthday cake? ;) Oh, wait, that's next Wednesday...woohoo!! The PPBF pick reminds me that I'm grateful my parents didn't make me keep my Chinese name after we moved to Canada. :D I should read this book, though. Funny, this may not have been the first time for kids, but I bet the large amounts of snow that some people got certainly made some adults feel very lucky! Haha! The book choice looks wonderful, the cover art and your description. Perfect for the classroom. I know from personal experience that many young children have a difficult time understanding why a person they already know, even if for just a short time, would change their name just becaus eit's 'different'. Looking forward to reading it! And I've alo already posted about our friend, the Phyllosipher, too! My kind of book! I love this story about finding the courage to be yourself. This looks absolutely lovely. Will definitely be giving this one a look. Sounds like it deals with a tough subject beautifully! I will have to check this one out at the library! It looks like a lovely story. Just wanting to fit in and be accepted is a huge thing at so many times in our lives. Having a name that's unique can be a difficult thing, not exactly 'fitting in' material. This book sounds like it really addresses the angles of adjusting to a new life and learning to embrace one's differences. Looks like a keeper, Susanna! I love the idea of a name jar and how one's name can be symbolic of so many things. In San Francisco, we have no shortage of kids just wanting to fit in, so this is a good one to have as a resource in our school library. Thanks! I just read this book a few weeks ago and added it to my multi-cultural book recommendations. Great pick! I hadn't heard of this book. Thanks for telling me about it. I will be checking it out. I love this book too. 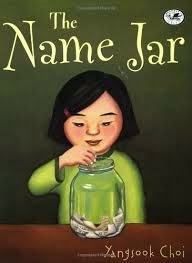 I used it as a read aloud when I was doing a name art project with my second graders. They loved it. Thanks, Darshana! I'm glad you like it too! You're very welcome, Jilanne! This is really such a nice book. You can tell by the writing that it's an older title - it has more than 4 words :) - but it's so beautifully done. Isn't it wonderful, Diane? I think it's just so nicely done! I agree, Vivian - it's so nicely done. And I love the idea of the name jar, and how genuinely her classmates want to help. I'm so behind it's horrifying! I lost one work day this week to the snow - my husband was home from work... enough said... And another to driving all over the east coast (that was today), so at this point it will be a miracle if I have a poem for Phyllis's birthday! It does, Joanne - I think you'd love it! Well, if it's snowing there is no possible way for there to be any shadows! So I think that will be a point in our favor :) It's supposed to be -12 with the windchill here tonight, so Phyllis has broken out her fleece-lined flannel PJs and her extra-warm nightcap :) I hope it will be warmer at your house! I know you have, Julie! I read it and loved it, but not sure if I left a comment or not - I have a feeling something distracting happened at that moment. I shall check! And yeah, it's kind of funny how many kids change their names. There are a lot of kids from China and Korea at my kids' schools, and they all go by made-up American names, which is so sad because their given names are so lovely! I was really surprised no one had picked this before - it's so wonderful! And I did check the complete list! (Which is not to say I mightn't have missed it... :) But I'm pretty sure it hasn't been done before.) I'm glad you like it! (Just noticed all my typos. They kill me!) No need to comment on the blog, busy woman! LOL! I never abandoned my Chinese name; I use it in context where Chinese is used. But, the phonemes are meaningless in English, and like girl in the story, I'm really so over having my name made fun of in English. I actually prefer my Chinese given name to my English given name. Love your choice this week Susanna. Such a universal topic for kids world wide who move to a new school in a new country and feel their name just doesn't quite fit the mold. Bad enough adjusting without having other kids make fun of your name or find it hard to pronounce. Love it. Sorry I'm a bit late, but I made it. Hmm.... good question. I would think the original Korean one, unless she had it legally changed. Most of the people I know who have chosen an American name use it for convenience, not for real documentation. I love this book! A lot of people in Asia do change their names to English ones, due to pronunciation difficulties, but this shows a very different way of handling the name dilemma. Tha Name Jar is one of my all time favorites. 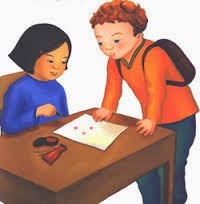 As an ELL [English Language Learner] educator, this sweet story was shared as a read aloud. Reading & writing with my ELLs from around the world brings me great joy. I have special memories of three students from Korea who walked through my classroom door, Tahoon, Cindy and Alex. They taught me and our classmates so much. I love, love this book! Names are so fascinating and personal. Folks have a lot of trouble with my name. I get all sorts of variations. But my name is PERFECT for who I am!! Thanks for sharing this one! I'm so happy to find so many other people who love this book! It's such a wonderful one, and how lovely that you've used it to such great effect with your students, Suzy! I need to get this book. When we came to the states both my brothers had to have their names changed. My brother Gert Jan became John and my brother Ernst became Ernest. I Stayed Clarike but had so many cruel names made up about me. I'm glad you like the book, but sorry you got made fun of! I wouldn't have thought Clarike would be that hard to say or that weird that kids would be mean about it - it's not that different from Clara... but you just never know with kids!